The AMP project has not always been greeted with the fanfare Google expected and after tonnes of feedback from publishers, google is making a change to how it displays Accelerated Mobile Pages. The change will help users easily view and share links that lead directly to publishers’ sites rather than to Google’s copy of the content. Google has been displaying AMP content by effectively making a copy of it and rendering it from its own servers, something that Google says makes AMP both faster and more secure for users. However, this has raised concerns with publishers and some users, who have found the system difficult for reaching content directly on a publisher’s site. That means those who copied and pasted the URL to share via a tweet, through Facebook or some other way were sharing Google’s URL, not the actual publishers' address. In the end, it made no real difference. 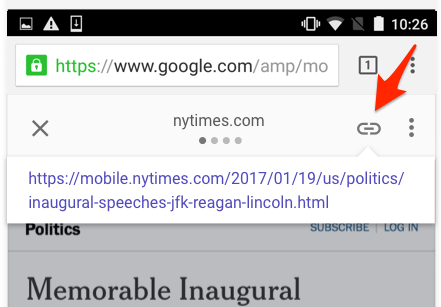 Google AMP URLs, when shared outside of Google, just redirect back to publishers. But that depends on Google maintaining the system that way. For many publishers, it’s just safer and more dependable to have people sharing their own direct URLs. For those who hold down on the anchor button, Google says it will trigger the native share feature of the browser being used. With Safari, that means easy access to things like Twitter or Facebook. With Chrome, it lacks native share, so nothing should happen. Next, to the anchor button, the three dots that Google calls the “overflow” icon brings up help information about how AMP is displayed. For those using Google’s search app on iOS, native sharing is already enabled. Google says that those using Google search through its app or native features on Android will get URL sharing features in the coming weeks. Google also said that it’s looking at ways to use the Web Share API so that the AMP header can offer to share directly if publishers make use of it. Whether this is enough to please some publishers will remain to be seen. It depends largely on users recognising what the new anchor button is intended for. Those who keep copying and pasting from the address bar will continue to get Google URLs. For more about Google’s stated reasons for making copies of AMP pages to improve security and speed, see our previous article or see Google’s blog post today on the Google Developers Blog, which goes into depth on the subject. Google doesn't look like it will be giving up on the AMP project anytime soon and it could have huge SEO impacts considering the growth of mobile search. While I'm not fully convinced this is the way to handle mobile it does have certain merits and could be the stepping stone to better technology.